With a Cygnus supply ship enclosed in its nose cone, the rocket rolled out of its Horizontal Integration Facility on a self-propelled transporter starting around 5:12 p.m. EDT (2112 GMT) Thursday for the mile-long journey to launch pad 0A on Wallops Island, Virginia. Orbital ATK’s ground team secured the rocket after reaching the seaside launch pad at dusk, then hoisted the booster vertical on its launch pedestal Friday morning. Engineers plan to run the Antares rocket through a final preflight checkout sequence before Sunday’s countdown, and senior managers will convene a Launch Readiness Review at 3 p.m. EDT (1900 GMT) Saturday to discuss the status of the launch vehicle, the Cygnus cargo ship, and ground systems. 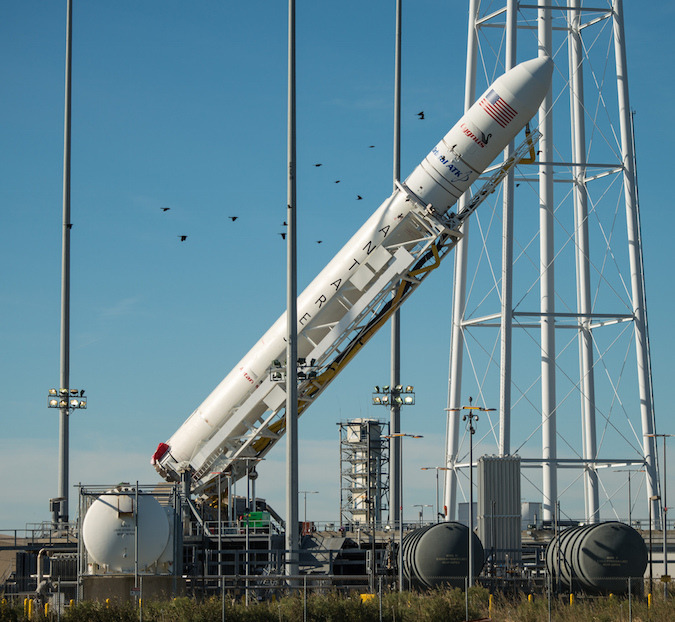 Officials delayed the launch from Friday as Hurricane Nicole beared down on Bermuda, home of a NASA tracking station needed to monitor the progress of the Antares rocket’s ascent into orbit. Hurricane Nicole passed over Bermuda as a Category 3 hurricane Thursday, but the storm only caused minor damage at the ground station, which is expected to be ready for customary pre-launch tests Saturday. Weather conditions at Wallops Island should be ideal for launch Sunday night at 8:03 p.m. EDT (0003 GMT). There is a 95 percent of favorable weather at launch time, according to a forecast issued Friday by the weather team at NASA’s Wallops Flight Facility, which operates the range at the Virginia launch base. Winds from the southwest will bring a warm and dry air mass over the Eastern Shore Sunday. The main weather concern for Sunday night is a low chance of thick clouds. Conditions at launch time should be partly cloudy, with a few clouds at 6,000 feet and scattered clouds at 10,000 feet and 24,000 feet. Winds will be from the southwest at 7 to 12 knots, and the temperature will be between 61 and 65 degrees Fahrenheit. 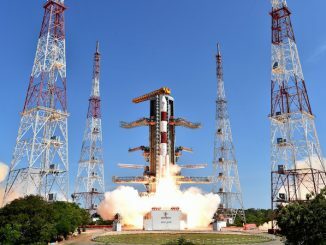 If the launch is delayed to Monday, similar weather is expected, with still a 95 percent of acceptable conditions. The mission will be the first space station flight to blast off from Wallops since an Antares rocket crashed moments after launch on Oct. 28, 2014, destroying a Cygnus cargo freighter and seriously damaging pad 0A at Wallops, which is part of the Mid-Atlantic Regional Spaceport owned by the Virginia Commercial Space Flight Authority, a state government agency. The state of Virginia, NASA and Orbital ATK each contributed $5 million to repair the launch pad. 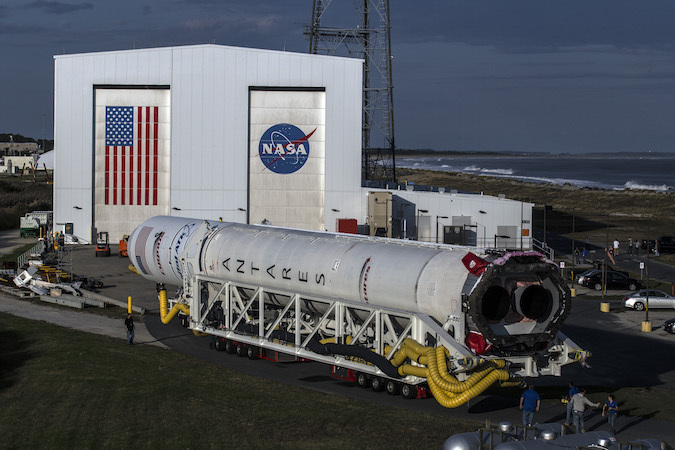 Orbital ATK ordered new RD-181 engines from NPO Energomash, a rocket engine-maker based in a suburb of Moscow, to fly on future Antares rockets. They replace the Antares rocket’s old AJ26 first stage engines manufactured in the 1970s for the Soviet Union’s N1 moon rocket. 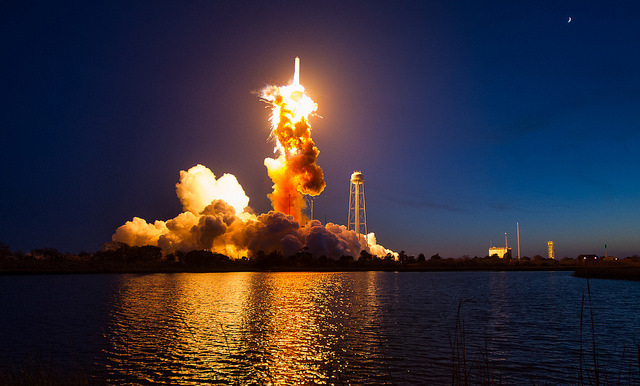 Engineers traced the source of the 2014 failure to the liquid oxygen turbopump in one of the Antares rocket’s two AJ26 engines, and Orbital ATK’s investigation found that a manufacturing defect in the turbopump’s turbine housing was the most probable cause of the failure. 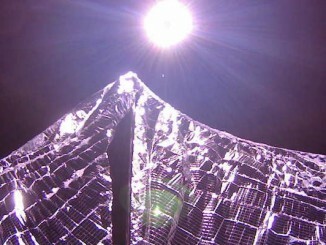 A NASA review team identified that issue and two other potential causes — a design flaw or foreign object debris — as the likely root of the mishap, which occurred approximately 15 seconds after liftoff. In any case, Orbital ATK managers opted to go with new engines for the Antares rocket’s return-to-flight and terminated its AJ26 engine contract with Aerojet Rocketdyne, which imported the powerplants — known as NK-33s in Russia — to the United States and modified them for flights on U.S. launchers. The RD-181 engine burns the same propellants as the AJ26 — kerosene and liquid oxygen — and is roughly the same size as the old engine. But it produces more thrust and burns fuel more efficiently, resulting in a 20-to-25 percent performance boost for the Antares 230 rocket, allowing the Cygnus spaceship to carry more cargo to the space station. 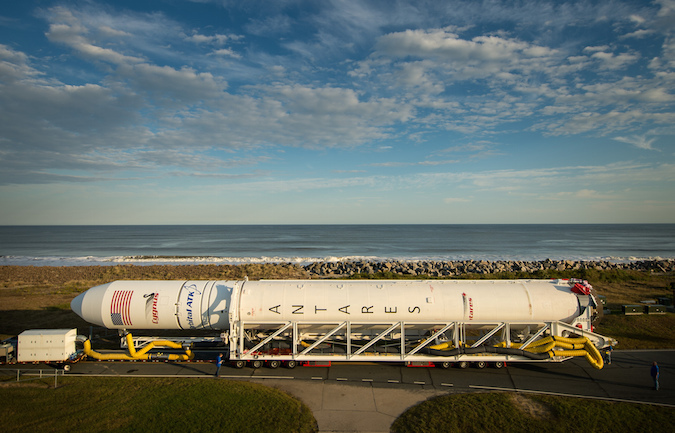 While the Antares team readied the rocket for new engines, Orbital ATK procured two United Launch Alliance Atlas 5 rockets for a pair of Cygnus cargo missions in December 2015 and in March. Sunday’s launch will be the sixth time Orbital ATK has sent a commercial resupply mission to the space station, and it is the third flight of an enhanced Cygnus logistics carrier with an extended pressurized module to hold more cargo and improved solar arrays. The mission is named OA-5 in Orbital ATK’s manifest. Assuming an on-time launch Sunday, the Cygnus spaceship will rendezvous with the space station early Wednesday. After an automated final approach, astronauts Kate Rubins and Takuya Onishi will command the space station’s robotic arm to reach out and grapple Cygnus around 7:20 a.m. EDT (1120 GMT) for attachment to the research lab’s Unity module. Cygnus will arrive at the station a few hours after the next three residents heading for the outpost lift off from Kazakhstan inside a Soyuz crew capsule. 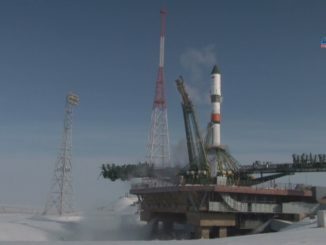 Cosmonauts Sergey Ryzhikov and Andrey Borisenko and NASA flight engineer Shane Kimbrough will dock with the station next Friday, Oct. 21, joining Rubins, Onishi and current commander Anatoly Ivanishin. The Cygnus spacecraft is nicknamed the S.S. Alan Poindexter after a former space shuttle astronaut who flew on two assembly missions to the International Space Station. 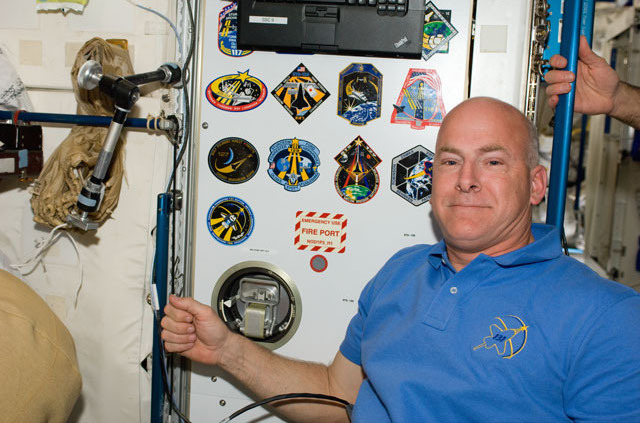 Poindexter, a U.S. Navy veteran who flew combat missions in the Gulf War, joined NASA’s astronaut corps in 1998 and piloted the space shuttle Atlantis on the STS-122 mission in February 2008, helping deliver the European-built Columbus laboratory to the outpost. He commanded the STS-131 mission to the space station in April 2010, Discovery’s penultimate flight, and retired from NASA at the end of the year. Poindexter died of injuries from a jet ski accident in 2012. The Cygnus cargo carrier is packed with 5,163 pounds (2,209 kilograms) of supplies, provisions and research hardware. The station crew will unpack the spaceship’s pressurized module, built by Thales Alenia Space of Italy, before Cygnus departs the complex with a load of trash in late November, when it will eject several CubeSats into orbit for Spire Global, owner of a growing fleet of commercial weather satellites. Before controllers send the Cygnus spacecraft on a destructive re-entry back into Earth’s atmosphere, they will activate a combustion experiment inside the cargo module. Called SAFFIRE 2, the experiment developed at NASA’s Glenn Research Center in Ohio will monitor how flames spread in microgravity, allowing researchers to study how a fire would behave in a vehicle in deep space. The experiment is contained inside a box the size of a suitcase. SAFFIRE 2 is a follow-up to a similar fire investigation conducted inside a Cygnus spaceship after it left the space station in June.